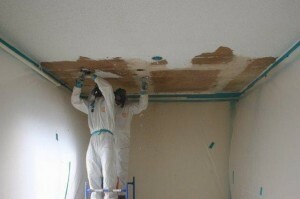 Popcorn ceiling removal in Redlands CA makes your property safer and more attractive. In reality, this last point alone is reasonable grounds for a popcorn ceiling removal in Redlands CA. At AQHI Inc., we have considerable expertise in popcorn ceiling removal in Redlands CA and we can get the job done correctly and safely. We follow industry best practices to remove the popcorn material without contaminating your property with asbestos dust in the process. For example, we seal off the work zone, continuously filter the air exiting the work zone, and use both wet and dry cleanup methods. All too often, clients face unexpected upcharges in the course of asbestos removal projects because the contractor has not included disposal in their price. You do not have to worry about this with AQHI Inc. on the job. Our bid for your popcorn ceiling removal in Redlands CA will include disposal. We have the necessary licenses to transport the asbestos waste to the appropriate disposal facility ourselves and this saves you money on the job. For more information about popcorn ceiling removal in Redlands CA or to get a custom bid, please call us at 800-481-8080. Our asbestos removal office for Popcorn Ceiling Removal in Redlands CA is open Monday through Friday between 8:00 AM and 5:00 PM and closed for lunch from noon to 1:00 PM. With advance notice, projects can be scheduled for weekends, early mornings and evenings.